The simultaneous use of other high frequency equipment (mobile telephones, domestic alarms, etc.) may momentarily hinder the operation of the remote control. If there is a permanent fault, the remote control has to be reinitialised. See “Changing remote control batteries”. A press on button A unlocks your vehicle. This is confirmed by rapid flashing of the direction indicators and lighting of the interior lamp (provided this function is active). This also deploys the exterior rear view mirrors. A short press on button C locks your vehicle. A long press on button C locks your vehicle and closes the windows and the sun roof. 2 successive presses on button C will deadlock the vehicle. It is then impossible to open the doors, either from the inside or from the outside. This operation is confirmed by the direction indicators illuminating for approx. 2 seconds and by the interior lamp switching off. This also folds the exterior rear view mirrors. If any of the doors, or the boot, is open or not properly closed, the central locking does not operate. With the vehicle stationary and the engine switched off, locking is signalled by the flashing of the interior locking control warning lamp. A press on button B activates the guide-me-home lighting (lighting of the sidelamps, dipped beams, registration plate lights for around 1 minute). A second press prior to the end of this timing cancels the guide-mehome lighting. If closing the windows and sun roof using the remote control, the user must make sure that no person is preventing the windows and/or sun roof from closing properly. It is dangerous to operate the deadlocking when a person is inside the vehicle as unlocking is impossible from the inside without the remote control. Pressing button E opens the boot. The flashing of the direction indicators for a few seconds. The interior lighting coming on. 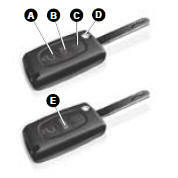 Button D is for folding and ejecting the key from its housing in the remote control. If you do not press on button D, you could damage the key mechanism. Unclip the cover to gain access to the battery. After a change of battery, it is necessary to re-initialise the remote control. To do that, switch on the ignition and immediately press button C of your remote control until you achieve the desired result. This may take some ten seconds. Note: Make a careful note of the numbers for the keys and for the remote control on the ASSISTANCE card. Keep this in a safe place. Do not throw away used batteries. Return them to a CITROËN dealer or take them to an authorised recycling facility (camera shops, etc). Except when reinitialising, the remote control cannot function while the key is in the ignition, even when switched off. Warning: by inadvertently actioning the remote control, when for example it is in your pocket, you can unlock the vehicle without your realising it. However, if none of the doors is opened within thirty seconds following an unlocking, the doors will automatically relock. Warning: there is a risk of damage if the replacement battery is not the correct one. Only use batteries that are identical or equivalent to those approved by CITROËN.